My father always told me I could be anything I wanted to be. My father believed in me and he had big dreams for me. I, however, had other dreams. When I was about 3 years old, my father was out in the yard building a picket fence and I said, “When I grow up I’m going to be a clown. I can even perform magic. Look, I can walk on nails.” The next thing I remember was waking up with bandages on my foot. That was the start of my clown journey. This was me surprising my son with a clown for his 6th birthday party.My friend Janet joined me. It was fun! I had know idea what day this would day would be the starting of. I didn’t think about being a clown until my son Miguel was in kindergarten and about to turn 6 years old. I wanted to hire a clown for his party but I soon found out that a clown was not affordable to me. 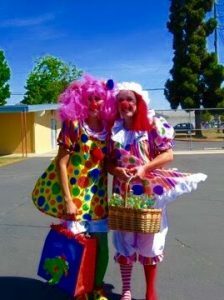 I thought to myself, “I could be the clown.” With the help of my sweet friend Janet Fry, we were the hit at the party. We had a lot of FUN! Thank you Janet. It was after this I met Frannie the clown outside Gypsy Treasure, who right away became my BFF (my Best Frannie Friend) . Frannie agreed to teach me how to face paint and twist balloons. We soon began painting the world together. 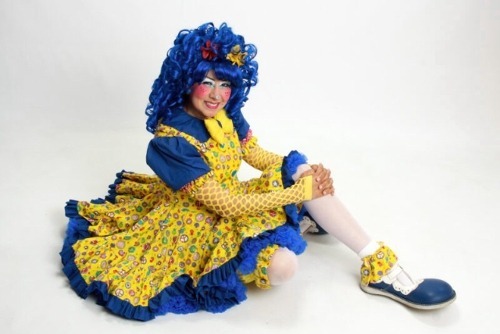 I learned a lot from her and became passionate about being the best clown I could be. I was determined and practiced day and night. BLUEtiful the Clown today posing with Ah OOO Gah. I still take online classes and attend jams to get better and better. There are many paths to become a clown. 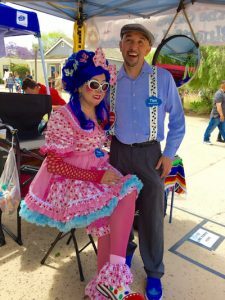 The San Diego All Star Clown Club offers clown classes periodically. If you have any specific questions for me, you can contact me as well. Happy Clowning!